Below are the official 2017 Hockomock League Golf All Stars, selected by the coaches in the league. Foxboro, 0 @ North Attleboro, 1 – Final – North Attleboro had a penalty kick denied in the first half but found the winner in the second half. In the 57th minute, junior Joe Hilf finished off a through ball from sophomore Joey Coscarella for the lone tally of the match. Franklin, 0 @ King Philip, 2 – Final – Zac White opened the scoring in the first half for the Warriors and Tyler Mann sealed the victory with a second half goal. Click here for a photo gallery from this game. Oliver Ames, 1 @ Mansfield, 1 – Final – Click here for a recap of this game. Sharon, 1 @ Milford, 1 – Final – Milford scored the go-ahead goal midway through the second half but Sharon found the equalizer with just three minutes to play to earn a point on the road. Wallison de Oliveira put the Hawks up in the 60th minute but Michael Bauer cleaned up a loose ball in the area to knot the game. Sharon nearly had the winner in the final minute, but Milford keeper Luke Capobianco made a key say. MHS head coach Brian Edwards added Tiago Carvalho played a great game in the midfield for the Hawks. Attleboro, 2 @ Taunton, 3 – Final – Samantha Tichelaar extended her goal-scoring streak to four games, while Megan Flanagan and Alex Wapenski each added goals to make it back-to-back wins for the Tigers. Khy Camaro, Emma Silvia, and Kasey Colvin each had assists in the win and Grace Pimenta made five saves. Stoughton, 2 @ Canton, 7 – Final – Freshman Olivia Rodman scored a hat trick and recorded an assist for the Bulldogs to keep Canton in a tie for second place in the Davenport. Fellow freshman Elisa Diletzia added a brace for Canton. Sarah Collins and Morgan McCabe also scored in the win. Chinazo Odunze scored the first for the Black Knights off a Mackenzie Manning assist and Manning scored the second from the penalty spot. North Attleboro, 4 @ Foxboro, 1 – Final – Ashlyn Gaulin had a hat trick for the Davenport leaders and Haley Ferrin added the fourth. Haley Guertin had a pair of assists, while Rachel Labonte and Kayla Pasquel each added one. According to North coach Bill Wallace, Emma Noreck led a “strong defensive effort” and he noted the solid play of Emily Chiasson, Lauren Dow, Sam Hawkins and Julia Tolfa. Lizzy Davis had the lone goal for the Warriors and Foxboro coach Katie Stalcup said that Alex Stamatos had a “great game” in the Foxboro defense. King Philip, 4 @ Franklin, 2 – Final – King Philip scored four times in the opening 20 minutes of the game and held on after Franklin scored two to halve the deficit before the break. Avery Snead scored twice and assisted on another, while Chloe Layne added a goal and an assist. Emma Corcoran had an assist and Ally Stanton added the fourth goal for the Warriors. Mansfield, 2 @ Oliver Ames, 1 – Final – Emily Vigeant scored a penalty kick that turned out to be the game-winner for the Hornets. Stephanie Kemp had the other goal for Mansfield. Milford, 3 @ Sharon, 0 – Final – Juliana France scored a pair of goals and Ashleigh Starks had one for the Hawks to end the team’s three-game winless streak and move Milford within a point of second place in the Davenport. Sharon coach Brad Furnival said that his team had its fair share of chances, including a Sabrina Robbins free kick that struck the bar, but that the Eagles “weren’t clinical enough. He added that the second Milford goal was “fantastic,” a 25-yard half-volley into the top corner. Canton, 2 @ Stoughton, 1 – Final – Canton’s Maggie Malloy and Kaitlyn Goyetch each found the back of the net as the Bulldogs held off Stoughton in a tight affair. Allie Howe scored Stoughton’s lone goal of the game. Franklin, 2 @ King Philip, 4 – Final – Click here for a recap and photo gallery from this game. Oliver Ames, 3 @ Mansfield, 3 – Final – Oliver Ames erased a pair of one-goal deficits in the second half to earn a draw on the road. The Tigers took the lead behind a goal from Hannah Stryke, assisted by Kayla Lozzi, but Mansfield stormed back with goals from Ann Maher (unassisted) and Brooke Downey (from Heather D’Ambra) to take a 2-1 lead at the break. Lozzi tied the game before D’Ambra put the Hornets back up on a feed from Emily Ierardo. Stryke netted her second of the game, on an assist from Maggie Woods, to tie the game. OA goalie Caitlin Grant made 11 saves in net. Sharon, 0 @ Milford, 9 – Final – Shannon Cormier netted four goals to lead the Scarlet Hawks to a big win over visiting Sharon. Danielle Fokas added three goals and Colby Bowers netted her first career goal in the win. Canton, 0 @ Stoughton, 3 – Final – Stoughton defended home court with a 25-19, 25-19, 25-14 win over visiting Canton. Senior Val Whalen led the Black Knights with 16 kills while senior Vicky Ramos had a strong game on the outside with five kills. Juniors Hanna Holden and Molly Turner combined for over 30 assists. Nicole Brown paced Canton with 20 assists and four kills, Taylor Harris had nine kills and Megan McDonough played great defense with 13 digs and a pair of aces. Foxboro, 0 @ North Attleboro, 3 – Final – North Attleboro got stronger as the match went on, notching a 25-17, 25-12, 25-6 sweep against visiting Foxboro. Tori Melanson had a strong day at both the net (seven kills) and serving (five aces) while Amelia Murphy finished with eight kills. Kezia De La Cruz had her best serving performance of the year, finishing with nine aces to go along with five kills. Franklin, 1 @ King Philip. 3 – Final – It was a strong team performance for King Philip, picking up a 25-17, 25-17, 20-25, 25-20 win over Franklin. Sydney Phillips led the way offensively with 18 kills, four digs and two blocks while Michaela Palumbo added nine kills and 10 service points and Grace Ely chipped in with six kills and two blocks, Kat Kmetz had a strong day serving with 19 service points while Elise Pereira had four aces and seven digs. Rachael Veilleux had a strong all-around day with 34 assists and 12 service points, including five aces. Oliver Ames, 2 @ Mansfield, 3 – Final – Trailing 8-7 in the deciding fifth set, Mansfield’s Katie Dardinski (11 service points) served six straight points to put the Hornets ahead for good. Mansfield won the match 17-25, 25-22, 25-22, 17-25, 15-9. Meg Hill had a strong day at the net with 23 kills while Lexi Gardner added nine kills and 20 service points. Julia Harrison added seven kills and 12 digs for the Hornets. For Oliver Ames, sophomore Ally Kemp had 35 assists to go along with five kills while Katie Flynn (14 kills) and Kayla Raymond (nine kills, six blocks, four aces) paced the Tigers’ offense. Junior Sadie Homer finished with 19 digs and three aces for OA. King Philip, 172 @ Mansfield, 163 – Final – Mansfield junior Jake DiSangro and freshman Nathan Morreale each carded rounds of 40 to lead the Hornets to a key division win over King Philip. Freshman Brian See added a 41 while senior Brendan Loomer carded a round of 42 in the win. Milford, 176 @ Stoughton, 186 – Final – Milford’s Riley Lynch and Stoughton’s Brendan Campbell shared medalist honors, each carding a round of 42. Milford’s Andrew Fauerbach added a 44 in the Hawks’ win. 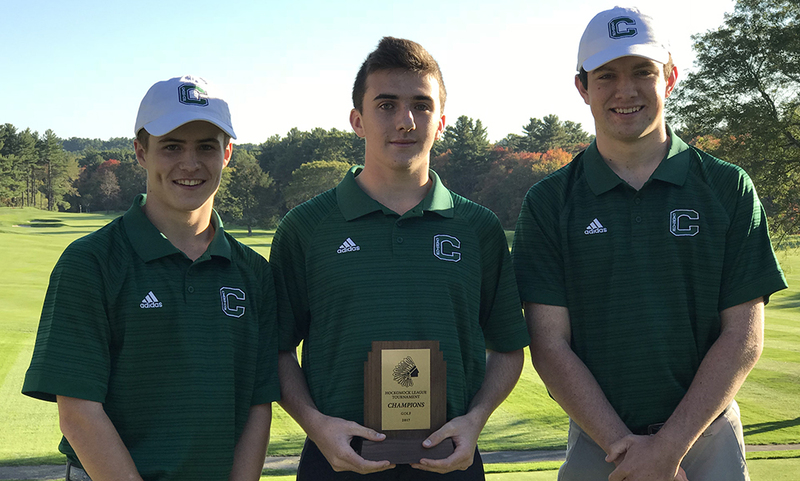 Franklin, 162 @ Attleboro, 167 – Final – Attleboro’s Corey McKenna and Franklin’s Bryan Woelfel earned co-medalist honors at Highland Country Club, but Matt D’Errico’s round of 40 and Gerard Collins and Jack Paterson both for 42 to help the Panthers earn the win. Jack Handy added a 41 for the Bombardiers. Sharon, 165 @ Oliver Ames, 137 – Final – Oliver Ames’ Thomas Walsh birdied on five of his last six holes to shoot an incredible four-under-par round of 30 to lead the Tigers to a win. Walsh sank a 20-foot put on the last hole to finish at 30. Walsh’s round, which may be a school record, was complemented by Ryan McGarry’s par round of 34, Mark Bissonette’s round of 36 and Eric LeBlanc’s round of 37. King Philip, 0 @ North Attleboro, 1 – Final – North Attleboro sophomore Joey Coscarella scored his first career goal, heading in a cross from Joe Hilf in the eighth minute for the lone goal of the game. Andrew Fontaine and Kevin Aguilar had strong defensive performances for Big Red while goalie Brendan Matracia registered six saves. North Attleboro, 2 @ King Philip, 4 – Final – KP bounced back from its first loss of the season to beat North behind a hat trick and an assist from Avery Snead. Snead opened the scoring three minutes into the game off an Emma Corcoran corner and 13 minutes later set up classmate Chloe Layne to double the KP lead. A minute before the break, Snead finished another Corcoran corner for a 3-0 advantage. Ashlyn Gaulin (off an assist from Felicity Monfils) got North on the board in the second half, but 30 seconds later Snead tallied her third, this time on an assist by Makayla Griffin. Ashlyn Gaulin scored a second goal, assisted by her sister Emma, with five minutes left. King Philip, 3 @ North Attleboro, 2 – Final – In a battle of the top two teams in the Hock, King Philip outlasted North Attleboro 25-21, 25-23, 19-25, 25-27, 15-13 in a non-league match. Senior Sydney Phillips notched 26 kills to pace the Warriors’ offense, adding 11 service points, nine digs and four aces. Michaela Palumbo added 16 kills, 10 service points, two digs and an ace while Kat Kmetz had seven service points, four kills and two aces. Elise Pereira (12 service points, seven digs, two aces) and Julianne Rando (12 digs, five service points) anchored KP’s defense. North Attleboro’s Leah Marceau (30 assists) set up the Rocketeers’ offense with Amelia Murphy (16 kills, four aces) and Tori Melanson (14 kills) having strong performances. Mansfield, 174 @ Taunton, 196 – Final – Mansfield freshman Nathan Morreale earned his first match medalist honor of his career, carding a low-round of 42 for the Hornets. Classmate Brendan See shot a 43 for Mansfield. Taunton, 3 vs. Coyle & Cassidy, 0 – Final – Taunton defended its home court with a 25-19, 25-22, 25-17 sweep over rival Coyle. Sam Reaume had a big game with 10 kills, nine aces, three digs and a block. Kayli Fagan added 25 assists, six aces and four kills while Jaime Brown and McKenzie Lucie played well defensively for the Tigers. Franklin, 157 @ Oliver Ames, 145 – Final – Oliver Ames’ Thomas Walsh fired a one-under-par round of 33 to lead the Tigers to their third straight win to start the season. Liam Barry added a 36, Nolan Donze shot 37 and Matt Kelley carded a round of 39 for the Tigers. King Philip, 161 @ Milford, 167 – Final – King Philip’s Danny McLoughlin led the way, carding a medalist round of 38 while teammate Matt Stanton shot a 39 for the Warriors. Andrew Fauerbach led Milford with a team-low round of 40. Mansfield, 164 @ North Attleboro, 157 – Final – North Attleboro’s Marcus Costa and Mansfield’s Brian See shared match medalist honors, each carding a 37 on the day at the middle course at Heather Hills. Colby Cameron added a round of 39 for the Rocketeers. Milford, 0 @ Franklin, 3 – Final – Franklin used solid defense and serve receive to help earn a sweep over visiting Milford. Lauren Lockhart finished with seven kills with what FHS head coach Kate Horsmann called “super smart hitting.” Maggie Doyle added five kills, two blocks and an ace and Meaghan Maguire chipped in with four kills and a pair of blocks for the Panthers. Stoughton, 210 @ Milford, 176 – Final – Milford’s Riley Lynch earned match medalist honors, carding a low round of 41 to lead the Scarlet Hawks. Andrew Fauerbach and Zach Tammaro each shot 44 for Milford. Attleboro, 178 @ Mansfield, 169 – Final – Mansfield freshman Brian See carded a team-low round of 40 to lead the Hornets while freshman Ryan Dow and junior Jake DiSangro each shot 42 and senior Brendan Loomer carded a round of 45. Attleboro’s Kyle DelSignore carded a match low round of 37 for the Bombardiers. Foxboro, 174 @ Taunton, 187 – Final – Chad Bearce led the way for Foxboro, shooting a team-low round of 42 while Noah Hicks carded a 43 for the Warriors. Taunton’s Jake Crawford scored a team-low 42 and Jake Giebel added a round of 43. Taunton, 50 @ Mansfield, 15 – Final – Mansfield had the top four runners in the tri-meet with Taunton and Bishop Feehan. Kevin Crawford won the race in 17:32, followed by Kalin Petrov (17:32), Patrick Heavey (17:33) and Collin Rice (17:51). Taunton’s top runner was Nolan Tavares (18:46). North Attleboro, 14 @ King Philip, 24 – Final – Click here for a recap of the Game of the Week. 1st Quarter: (KP) Cole Baker 22-yard field goal. 2nd Quarter: (NA) Chad Peterson 21-yard pass to Nolan Buckley, Geoff Wilson XP good; (KP) Brendan Lydon 71-yard pass to Aidan Bender, C. Baker XP good; (KP) B. Lydon 13-yard pass to David Morganelli, C. Baker XP good. 4th Quarter: (NA) C. Peterson 27-yard pass to Marion Bresko, G. Wilson XP good; Shane Frommer 57-yard rush, C. Baker XP good. 1st Quarter: (C) Joe Leonard 31 yard pass to Jack Andrews, XP good; (A) Cam Furtado 1 yard rush, XP failed. 2nd Quarter: (A) C. Furtado 6 yard rush, XP failed. (C) Hayden Lacroix 8 yard rush, XP good; (A) C. Furtado 16 yard pass to Elvin Sam, 2pt failed; (A) C. Furtado 29 yard pass to Jeremy Haas, XP failed. 3rd Quarter: (C) H. Lacroix 37 yard rush, XP failed. (C) J. Leonard 14 yard pass to H. Lacroix, XP failed. 4th Quarter: (A) C. Furtado 32 yard pass to Justin Cote, C. Furtado 2pt rush. (C) J. Leonard 31 yard pass to Mason Matos, XP good. 1st Quarter: (C) Alec Ragusa 3 yard rush, Owen Lehane XP good; (C) A. Ragusa 4 yard rush, O. Lehane XP good; (C) Gersom Rivera 4 yard rush, O. Lehane XP good. 2nd Quarter: (C) A. Ragusa 4 yard rush, O. Lehane XP good; (C) G. Rivera 14 yard rush, O. Lehane XP good. 4th Quarter: (5) Pentucket 5 yard pass, XP good; (C) Alain Jean 62 yard rush, O. Lehane XP good. 1st Quarter: (H) Matt Lahiff 32-yard field goal good; (F) Liam Foley 9 yard pass to Mike Luong, Russell Neale XP good. Stoughton, 28 vs. Franklin, 14 – Final – Click here for a recap of this game. 1st Quarter: (F) Jake Noviello 8 yard pass to Sean Leonard, Matt Zucco XP good. (S) Evan Gibb 15 yard pass to Ajahn Rue, Josh Cocchi XP good. 2nd Quarter: (S) E. Gibb 35 yard pass to Ruben Gonzalez, J. Cocchi XP good. 3rd Quarter: (S) E. Gibb 35 yard pass to R. Gonzalez, J. Cocchi XP good. 4th Quarter: (F) Even Wendell 13 yard pass to Jack Nally, M. Zucco XP good. (S) E. Gibb 1 yard rush, J. Cocchi XP good. 1st Quarter: (M) Damani Scott 38 yard pass to Joe Cox, XP failed. (W) Brett Lavanchy 5 yard pass to Chase Conrad, XP good; (M) Danny DeGirolamo 27 yard rush, Hunter Ferreira 2pt rush good. 2nd Quarter: (W) B. Lavanchy 5 yard rush, XP failed; (M) J. Cox 12 yard rush, Mike Debolt XP good; (M) D. Scott 36 yard pass to D. DeGirolamo, 2pt failed. 3rd Quarter: (M) D. Scott 36 yard pass to Mike Shannon, M. Debolt XP good. 3rd Quarter: (M) Will Pointer 19 yard rush, Sean Lehane XP good. 1st Quarter: (B) Bedford 30 yard pass, XP good; (OA) Anthony Berksza 35 yard rush, XP failed. 2nd Quarter: (OA) Curtis Cann 15 yard pass to Ethan Eckstrom, 2pt failed; (OA) Safety; (OA) A. Berksza 10 yard rush, XP failed. 3rd Quarter: (OA) A. Berksza 5 yard rush, XP no good. 4th Quarter: (OA) A. Berksza 30 yard rush, 2pt failed; (B) Bedford 25 yard pass, 2pt good. 1st Quarter: (T) Noah Leonard 8 yard pass to Jahmeir Lewis, John Teixeira XP good; (T) Woudanly Danger 4 yard rush, XP failed. 2nd Quarter: (T) TJ Mendes 5 yard rush, XP failed; (T) T. Mendes 4 yard rush, XP failed. 3rd Quarter: (NB) Tru Williams 39 yard rush, XP good. 4th Quarter: (NB) T. Williams 14 yard pass to Jeremy DaCruz, T. Williams 2pt pass to Edgar Semedo. Franklin, 0 @ Xaverian, 1 – Final – Franklin head coach Fran Bositis noted improvement from the Panthers’ opening game and said his side played hard, but couldn’t find the back of the net. Oliver Ames, 5 @ Stoughton, 0 – Final – Oliver Ames used three different goal scorers to race out to a 3-0 lead through the first 40 minutes and added a pair of second half strikes to open 2017 with a win. Senior Brandin Osborne netted a goal in each half while Matt Alvarado, Jack Sheldon, and Michael Nikiciuk each scored once. Sheldon, Nathaniel Cardoza, James Gillespie, Josh Melnick and freshman Matt Nikiciuk each registered an assist. Stoughton, 3 @ Attleboro, 4 – Final – Attleboro scored a pair of goals in each have and senior goalie Katie Pelletier turned aside nine shots to help the Bombardiers edge Stoughton. Grace Mayer scored a pair of goals for Attleboro in the first half, the latter on an assist from Eliza Sabilla. Alex Compton netted both goals in the second half for Big Blue, converting assists from Mayer and Abigail Boudreau. Allie Howe found the back of the net twice for Stoughton while Alanna McCormick scored once. Canton, 4 @ Mansfield, 1 – Final – Canton junior Maggie Malloy scored a hat trick to lead the Bulldogs to a win on the road at Mansfield. Foxboro, 1 @ King Philip, 4 – Final – After a scoreless first half, King Philip exploded for four goals in the second half. Nicole Connor opened the scoring off an assist from Alli Meehan just under three minutes into the second half and six minutes later, Meehan doubled the lead with an unassisted goal. Liz Furfari scored back-to-back goals four-minute span, the first off a feed from Christina Hathaway, the second from Meehan. Foxboro tallied with just under three minutes to play when Lily Daly finished a pass from Jackie Brion. KP finished with 19 shots and 14 corners. Milford, 1 @ Franklin, 4 – Final – Franklin junior Cassi Ronan registered her first hat trick of the season, including scoring on a penalty stroke, to lead Franklin over Milford. Freshman Victoria Quinn scored for the second straight game, finishing off an assist from sophomore Elizabeth Clark. FHS head coach Lisa Cropper also noted junior Emily Valentino had a strong game for the Panthers. North Attleboro, 0 @ Taunton, 1 – Final – Taunton senior Kya Enos scored the lone goal of the game just over midway through the first half. Enos converted the lone tally on an assist from Liana Duarte. Taunton goalie Emma Sheehan turned away nine saves to record the shutout. THS head coach Liz Hathaway said Kathryn Robinson and Lauren Torres both had strong games for the Tigers. Sharon, 0 @ Oliver Ames, 8 – Final – Oliver Ames had seven different players find the back of the net in the win, with Liz Nuss registering a pair of goals. Attleboro, 0 @ Canton, 3 – Final – Canton’s Nicole Brown (15 assists) did a great job running the offense in her debut as starting setting according to head coach Pat Cawley as the Bulldogs registered a 25-17, 25-23, 25-16 sweep of Attleboro. Megan McDonough led the defense with 12 digs and was “a strong leader on the court,” according to Cawley. Cawley added Sofia Connor and Hannah Jerrier played strong all around games, combining for 10 kills. Mansfield, 3 @ Foxboro, 0 – Final – Mansfield opened its 2017 campaign with a 25-23, 25-16, 25-23 sweep on the road at Foxboro. Senior Meg Hill led the offense with 13 kills and senior Lexi Gardner chipped in with seven kills. Senior Emma Ascoli finished the game with 25 assists for Mansfield. Franklin, 1 @ North Attleboro, 3 – Final – Franklin fought off the sweep but North Attleboro finished the match in four sets, 25-20, 25-18, 25-27, 25-20. Kezia De La Cruz led the Rocketeers with 12 kills and a pair of aces while Katie DeMontigny had nine kills and two aces in the win. For Franklin, Meaghan Maguire had eight total blocks (six solo) and five kills, Hailey Sanders added three blocks (one solo) and five kills and Lauren McGrath had 19 assists and four aces. King Philip, 3 @ Milford, 0 – Final – King Philip slammed the door shutout on its sweep of Milford with senior Michaela Palumbo accounting for 16 service points in the third set alone in a 25-20, 25-11, 25-7 win. Palumbo also had five kills and five aces in the win while Sydney Phillips had 11 kills and Grace Ely notched three kills. Oliver Ames, 1 @ Stoughton, 3 – Final – Stoughton senior Val Whalen had a very strong game in a 3-1 (25-16, 20-25, 25-9, 25-21) win over visiting Oliver Ames. Whalen led the way with 19 kills, 13 digs and six blocks while juniors Molly Turner and Hanna Holden combined for over 30 assists. OA’s Emma Petrillo had seven kills and four aces, sophomore Allie Kemp had 22 assists and Sadie Homer notched 10 digs and two aces. Taunton, 2 @ Sharon, 3 – Final – In a back and forth match, Sharon emerged with a 22-25, 25-20, 25-16, 20-25, 15-11 win over visiting Taunton. For the Tigers, Sam Reaume had 10 kills and an ace, Kayli Fagan notched 26 assists, five aces and four kills and McKenzie Lucie played well in the back row according to head coach Toby Chaperon. Mansfield, 165 @ King Philip, 167 – Final – Mansfield freshman Ryan Dow had shot a team-low round of 38 to lead the Hornets to their first win. Freshman Brian See added a 41 in the win.